SCVHistory.com LW3145 | Melody Ranch | Lobby Card: 'Arizona Whirlwind,' Monogram 1944. 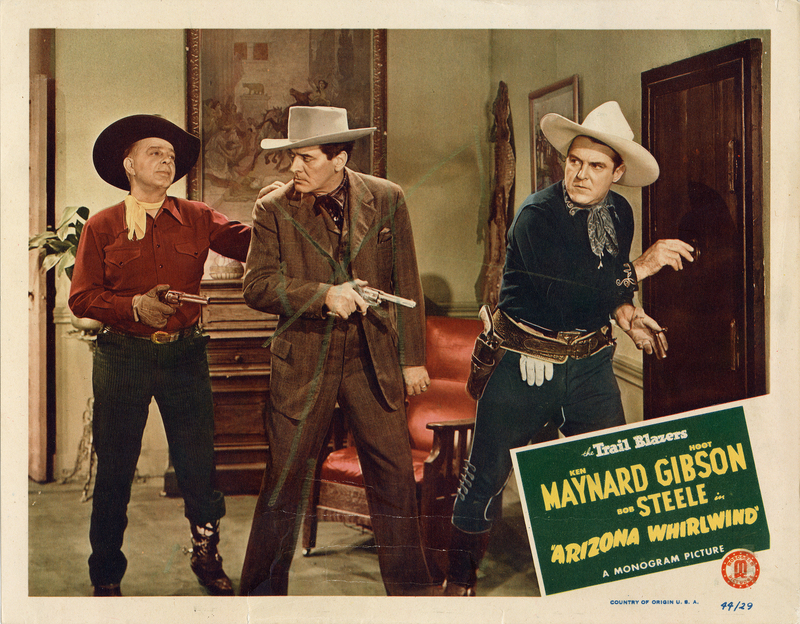 Aging Western stars Hoot Gibson, Ken Maynard and Bob Steele are teamed up as the Trail Blazers in a 1944 "buddy picture" from Monogram, "Arizona Whirlwind." Filmed at Ernie Hickson's Placeritos Ranch, aka Monogram Ranch (later named Melody Ranch), as well as Corriganville (Simi Valley) and elsewhere in the Santa Clarita Valley, apparently including the Triple A Ranch (Vasquez Rocks). LW3145: 9600 dpi jpeg from original lobby card purchased 2017 by Leon Worden.